Thickness Gauge For Testing Lab for Aggregate Testing Lab - Used for determining the Flakiness Index of Aggregates, technical teaching equipment for engineering. It Consists of a frame with a sliding panel. 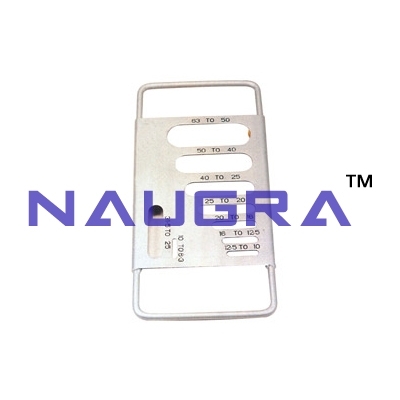 The Panel has slots of Different Standard Lengths and Widths accurately Cut..
We are leading manufacturers, suppliers & exporters of Thickness Gauge For Testing Lab for Aggregate Testing Lab. Contact us to get high quality designed Thickness Gauge For Testing Lab for Aggregate Testing Lab for schools, colleges, universities, research labs, laboratories and various industries. We accept bulk orders for government tenders in all countries around the globe.